Qantas’s negative working capital position (equivalent to a Current Ratio of less than 1:1) used to really baffle me because all the accounting texts suggested an optimum rule of thumb of about 2:1. Didn’t this mean that Qantas was insolvent and unable to meet its short-term obligations? What I discovered was that most airlines operative on a negative working capital position. Airlines like Qantas use their supplier’s capital to help finance their operations. Qantas holds very little cash reserves and uses the cash when customers prepay for their flights to pay long-term debt, thus reducing the costs of funding. Qantas also gains because Banks pre-pay for the right to issue their customers Frequent Flyer deals on credit cards. In addition, Qantas has facilities in place (including a standby facility of $300 million and the issue of short-term notes) to draw cash when needed to pay creditors. Qantas’s negative working capital position is by far the highest among ASX200 companies. Analysts are now suggesting this is one of the reasons behind Qantas recent success. Also, it will continue to work in Qantas favour especially as interest rates look set to rise. This seems evident as Qantas is on track to report a record underlying profit before tax in 2017/18 of between $1.55 and $1.6 billion as it reported a 7.5% rise in its third-quarter revenue. Qantas has just announced it will order 6 more Dreamliners for its international network as it looks to retire the last of its Boeing 747’s. The only negative for Qantas is that oil prices are increasing. The airline’s fuel bill which accounts for over 20% of its costs is expected to rise by $200 million in 2017/18 despite its hedging program. 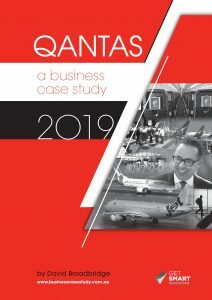 Source: These figures reveal a big secret behind the success of Qantas as it heads for a record profit by Sam Jacobs Business Insider May 2nd, Qantas to withdraw all 747’s by 2020 as more Dreamliners ordered by Jenny Wiggins Australian Financial Review May 4th.